EDIT: Giveaway is officially over. Congratulations to Rab Pom for submitting the randomly chosen 938th entry. If you're feeling blue about summer ending soon, brighten your mood with some sparkles! 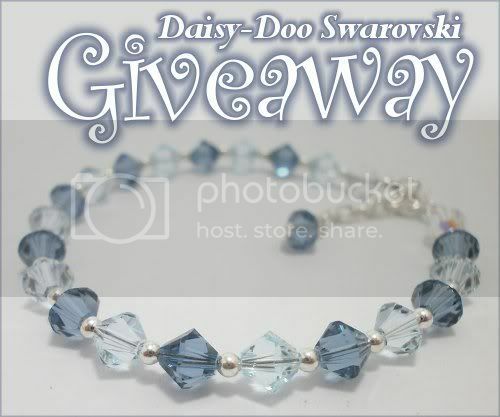 Jacqui of Daisy-Doo is giving away the Swarovski crystal bracelet above to one lucky lady. She's alternated one of Swarovski's latest 2012-2013 Autumn/Winter color releases, Denim Blue, with Light Azure crystals and sterling silver spacer beads. The calm color scheme will keep the winner looking cool during the chillier seasons. The blue bracelet even has a silver extension chain, so the clasp can be secured anywhere from 7.5 to 8.5 inches long. It will arrive professionally packaged in a 2 piece white leatherette box, embossed with silver Daisy-Doo logo. Jacqui designs a variety of sparkly products using Swarovski crystals and elements, from pearl necklaces to wedding tiaras to Christmas ornaments. However, she specializes in personalizing bracelets as gifts to loved ones of all ages. Family is very important to her - she stopped teaching secondary school math after a career of 16 years so she could spend more time with her own children. And if you've been hanging around the branches of this blog lately, you've already met one of her lovely daughters, Jenny of Spearmint and Thyme, through her daisy hair pins giveaway last month. The apple didn't fall far from that talented tree, hmm? Use the Rafflecopter below to enter to win Jacqui's jewelry giveaway before 11:59pm EST on September 20, 2012. Worldwide giveaway is open to people ages 18+. Be sure to leave the mandatory comment on the blog post with the same name you use to fill out the Rafflecopter - all entries by winner must be easily verified or a new winner will be chosen. My favorite is the Double Strand Crystal & Pearl Necklace. I adore the Chunky Pearl Crystal Necklace! My favorite things from her shop would be: http://daisy-doo.co.uk/Pages/Shop%20pages/Necklaces/SimpleIllusion.html.. Thanks for the giveaway! the Pearl & Crystal Chunky Necklace is gorgeous!!! Love the Swarovski Crystal Firework Pin! amazing!!! Would look great either at work or night out! I like Swarovski Crystal and Pearl T-Bar Necklace...ciao4now64 at yahoo dot com. I adore the two tone crystal daisy pins and crystal and pearl cluster illusion necklace! I like Sterling Silver Mesh & Swarovski Crystal Bracelet. white Swarovski and pearl name bracelet is my fave!! I like Black Leather and Sterling Silver Butterfly Bracelet. ...that is just so beautiful! Love the shade of blue! Christina - xristya@rock.com - I like the Svarowsky Crystal and Pearl Bar Necklace! I love the pendant http://www.daisy-doo.co.uk/Pages/Shop%20pages/Necklaces/Heart1Necklace.html but a 16" chain would choke me! This is my favorite! I love it, so beautiful! i simply couldn't decide for just one favorite!! I like Pearl and Crystal Chunky Necklace. I love the Pearl & Crystal Chunky Necklace. I love the Chunky Montana & Crystal AB Bracelet. Maple and Daisy Tiara is superb! The Crystal and Pearl T Bar Necklace or the Pearl Clusters Illusion Necklace. I like Swarovski Crystal Snowflake Necklace - with White Opal Starshine Crystals. My favorite is the double strand crystal and pearl necklace. my fav is Double Strand Swarovski Crystal and Pearl Necklace. Thanks. Lubka K.
I like the chunky montana and crystal bracelet! I love the Double Pearl and Crystal Alice Band. Love the Sterling Silver European Chain Bracelet. I love the Swarovski Crystal Snowflake Necklace. I love the 7 Petal Alpine Lily Side Tiara! So pretty! I like the snowflake necklace. The Mother of Pearl and Swarovski Crystal Bracelet is so beautiful. I really love this bracelet the Mother of Pearl and Swarovski Crystal Bracelet. I like the mother of pearl and crystal bracelet. My favorite item is Swarovski Crystal Snowflake Necklace. Thanks so much for the fantastic giveaway! My favorite is the Chunky Swarovski Dark Indigo Bracelet. If i win can you e-mail me at godsheartone@yahoo.com ? Thanks! I love the Swarovski Crystal Snowflake Necklace-it's gorgeous! Love the Swarovski Crystal Heart Necklace. I love the Chunky Swarovski Dark Indigo Bracelet, it's so pretty. I love the Red Leather and Sterling Silver Bracelet! My favorite item is the Simple Crystal and Pearl Illusion necklace. - Judith R.
The Swarovski Crystal Snowflake Necklace is stunning! I love this Swarovski bracelet and its in my fav colour too. I like the Pearl & Crystal Chunky Necklace. Love the Crystal princess tiara. Thanks for the opportunity. i just loved the swarovski cyrstal candy cane ornaments,there precious!!! I like Sterling Silver Mesh & Blue Zircon Name Bracelet. I want to give the Swarovski Crystal & Pearl Illusion Necklace to a girl. I think it's hot. Please Enter Me In Your Daisy-Doo Giveaway. Blue Swarovski Crystal Bracelet For My Mother. In Response To Your Requirement To Comment with your favorite item from Daisy-Doo. I like the Maple & Daisy Tiara. My favorite piece from the site is the extra chunky bracelet made with 10mm Swarovski Dark Indigo Blue crystals. My favorite item is the pearl and crystal chunky necklace! I like The Diasy Doo Leather Bracelet! Double Strand Swarovski Crystal and Pearl Necklace is pretty. I like the Swarovski Crystal Heart Necklace. My favorite Daisy-Doo item is the chunky bracelet is made with 10mm Swarovski Dark Indigo Blue crystals separated by sterling silver beads. The Swarovski Crystal Snowflake Necklace is gorgeous.